This page is dedicated to the Ekegusii Encyclopedia Project , instigated and directed by Mr. Kennedy Momanyi Bosire of Mombasa. The Abagusii are one of the ethnic tribes which comprise the Republic of Kenya and speak Bantu language, Ekegusii, an endangered language. We believe Ekegusii should be protected and preserved. The PRINTED VERSION is now out and can now be purchased by emailing us. Any of you with relatives / contacts / friends in Kenya, or who work in University language /liguistics departments - please spread the word!! . Kennedy Bosire is an Ekegusii language activist who played a key role in InField 2008 at the University of California as an instructor in Field Methods for the Ekegusii workshop and a presenter in the Models of Language Documentation and Revitalization workshop (both coordinated by Carol Genetti). "Language documentation is for the future and targeting the youth must be our strong point". Ekegusii Encyclopedic Project is a community based organisation registered under the Ministry of Culture and Social Services in the Republic of Kenya. 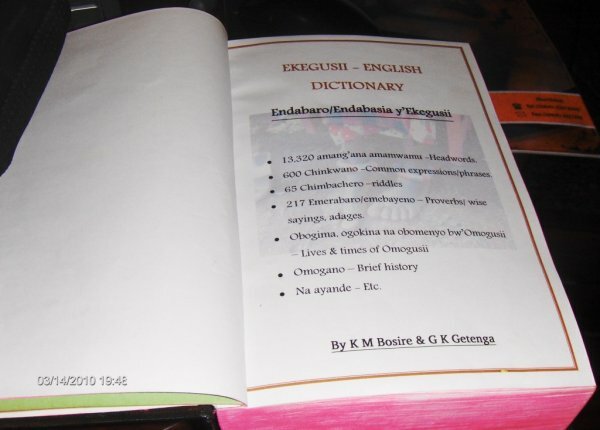 We are in the final stages of preparing the paper copies of a detailed Ekegusii Dictionary for publication. Kenya's library services have allowed us to be publishers of our works and have granted us ISBN numbers. Get confirmation from the editors that we are ready for printing. Identify and engage a printer. Raise funds for the printing. The title page of this magnificent dictionary is shown here; click on the thumbnail for the detail. 1. To raise awareness among the Abagusii community of the state and level of endangerment of the language. 2. To encourage its learning and promotion. 3. To document, preserve and archive it. 4. To help establish an organisation to initiate, spearhead and oversee the language's dynamism especially in technology, communication, medicine and the environment. 5. To facilitate community support for families, providing care for people living with HIV/AIDS and orphans and to ensure programme sustainability through income generating activities. 1. Generate Encyclopedic materials in the form of dictionaries, references and other literature. 2. Establish cultural community centres. 4. Train personnel to sustain the gains and propogate them for posterity. 5. 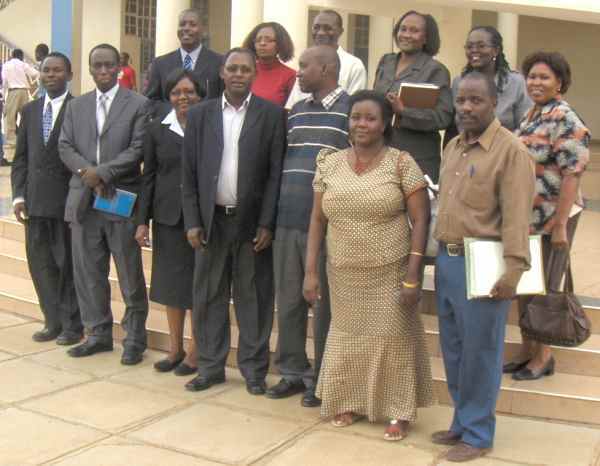 Organise HIV-AIDS outreach programs: home based care, counselling, feeding and education. Older news is shown further down. This page will shortly be updated. The older news will remain online, accessible via the ARCHIVE link above. Specific Objectives Why are we doing this? More carvings What is a language? .....You may wonder why we are concerned about Ekegusii, an African language which most people in the West know nothing about. An explanation is given here. If you are concerned about globalisation and the way it can destroy our identity, please read it..
Each time we think we are ready, something else comes up to hold us back. Our volunteer editor has requested an overhaul of what we have done on the dictionary, meaning that we cannot go ahead with the publication yet. We hope that a short time hence we will have done the necessary extra work. We have gathered a large number of photographs and found an illustrator who is willing to inset them in the dictionary, making it look very appealing. We have yet to find a sponsor, but we are in good spirits. copyright Kennedy Bosire (projects) / Nigel Deacon (website).